O'Fallon is a growing city with a variety of entertainment options and attractions, but the human population isn't the only one expanding. The city experiences all four seasons to the extreme, with summertime highs sometimes exceeding 100 degrees Fahrenheit and winter lows occasionally dipping below 20 degrees. With above-average precipitation and humidity in some seasons, the conditions are perfect for insects, rodents and other pests to thrive. When those pests invade your property or infest your home, pest control services can bring fast relief while limiting damage to your property. If you want to prevent infestations for complete protection of your home and your loved ones, contracting with a professional extermination team is crucial. You will learn how to maintain your property so that your living environment is inhospitable to the most common Missouri household pests. Ants are one of the most common pests to invade homes, and they may seem harmless due to their size. You can easily kill them and remove them from your home, but they typically come back within minutes or overnight. 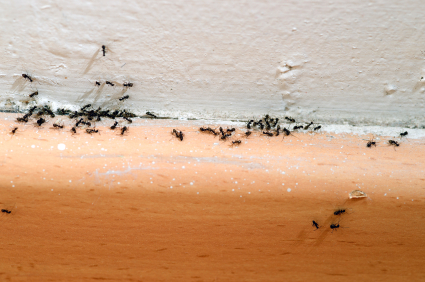 Most homeowners will grow frustrated with repeat infestations, and there are often concerns about spraying too much pesticide inside the kitchen or other areas of the home where ants seem to congregate. Treatment for ants often starts by not leaving food out and ensuring that all surfaces are clean and dry at all times. If the insects persist, working with professionals for long-term extermination with safe, non-toxic product is essential. Once you see a cockroach in your home or in outside buildings, you can guarantee that more are soon to come along. Not only can they get into your food supply and cause embarrassment when you have company, but they also carry diseases and bacteria that are sometimes toxic to humans. There are multiple types of cockroaches commonly found in Missouri homes, including German, American, Oriental and Brown-Banded roaches. Not all roaches infest homes in search of human food and water. Piles of clothing, paper and other debris are big attractions for some breeds as well. All types of roaches grow massive populations in short periods of time, so fast treatment is essential. Fleas are flightless, but they jump so high and so fast that you might think they're flying. They drive cats and dogs to nonstop itching and can bite humans on the arms and legs when an infestation takes root in your carpeting or even on some hard floors. Like roaches, they develop massive populations in little time and require fast action if you want to eliminate them from your property permanently. Have you noticed an intrusion of pests on your property? Contact Guardian Pest Control today for a free quote. We respond promptly and utilize the most effective treatments and preventative measures to protect your property and your loved ones.